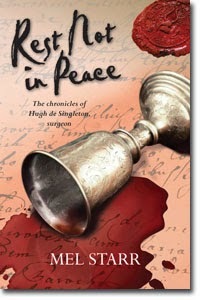 I've had the chance to review a couple other books in Mel Starr's The Chronicles of Hugh de Singleton, Surgeon series, and I really enjoyed them. So I certainly jumped at the chance to review book number 6, Rest Not in Peace. Master Hugh, surgeon and bailiff, is asked to provide a sleeping potion for Sir Henry Burley, a friend and guest of Lord Gilbert at Bampton Castle. Sir Henry—with his current wife, a daughter by a first wife, two knights, two squires, and assorted servants—has outstayed his welcome at Bampton. I have loved everything I've read in this series! You can see my reviews of A Trail of Ink (Book 3), Unhallowed Ground (Book 4), and The Tainted Coin (Book 5). I think thee books are more fun if you've read the previous titles (I did go back and find books 1 and 2! ), but this one -- like the others -- does stand alone. Hugh de Singleton shines in this book too, of course. Master Hugh is charming, thorough, kind... and always seems to end up in the middle of some not-so-great situations. Of course, when he is in the middle of solving yet another murder mystery, we shouldn't be surprised that he encounters some unsavory characters. Mel Starr clearly has done plenty of research of the time period and the places. I love the detail, and although I'm not remotely an expert on medieval England, the settings, word choices, characters, etc. always ring true for me. One challenge with this book (which I've mentioned in previous reviews too) is the medieval language. The first chapter or so is usually pretty challenging reading, with all kinds of words you just aren't used to (check the glossary!). After a chapter or two, that isn't as noticeable though, as you've learned (or re-learned if this isn't your first Hugh de Singleton Chronicle!) what words like maslin, pottage, and solar mean. Basically, what I'm saying here is: the first couple chapters might take a bit more mental energy, but it is worth it. One thing I have loved about all of this series is that Master Hugh ends up in situations where it would be easier to leave things be, to go along with the rational assumptions being made by others. And he knows that life would be simpler, as he struggles internally with doing the right thing vs. doing the easy thing. It's those moral and ethical dilemmas that really intrigue me. Love this series. Can't wait to read book 7.